ABSTRACT: The penetration of mobility and mobile devices was expected to disrupt the payments ecosystem – instead, major OEMs and OS platforms compete for prominence in the payments ecosystem in the US, sluggishly attempting to lead the US to become leading “digital wallet” platform providers. The laggard nature of the US market contrasts with other markets given the US’ unique combination of market players, processes, and consumer expectations. We explore two observable routes of implementation and the associated strategic implications on the future for the digital wallet. The convergence of mobile, digital, and financial services theoretically created a prime environment for the rapid growth and adoption of the “digital wallet.” See Exhibit 1. Instead, the convergence of ecosystems has fallen short of satiating industry hype as indicated by the fragmented and patchy adoption across an arguably prime U.S. consumer market. Exhibit 1: What is the digital wallet? Arguably, the collision with the mobile technology ecosystem, led by “disruptive” players (e.g., PayPal, Apple) contributed to the hype – however, the unique industry, regulatory, and consumer dynamics of retail finance represent a material barrier vis-à-vis traditional technology-driven market models driven by network effects, an innovation cycle, and consumer demand. Unlike markets that have readily accepted newly launched digital wallet technologies, like Japan and South Korea, where digital wallets experienced rapid and major penetration effectively engraining their usage into daily life, the U.S. market contrasts through a laggard payment infrastructure necessary to incentivize merchants and consumers alike. Indicative of the unique barriers characterizing the U.S. market, and POS payment infrastructure specifically, the October 2015 notice to implement EMV chip enabled terminals, which typically includes NFC contactless payment capabilities, has been received with underwhelming adoption: less than 40% of businesses currently are capable of newer POS transaction methods. Alongside a slow payment infrastructure refresh cycle and consequently, laggard adoption rates, a lack of standardization across existing digital wallet options has further pushed out the adoption curve: market fragmentation has led to competing players establishing degrees of exclusivity in an attempt to retain their market base – but with a side effect of hindering mainstream adoption. A notable form of fragmentation, driven by merchants through a JV, like the Merchant Customer Exchange’s resistance against Apple Pay in favor of its own product (and prompted first by pushback against credit card network interchange fees), CurrentC, is a proprietary, merchant-driven solution that adds yet another digital wallet solution to the consumer mix. The pilot technology employed includes QR codes, a POS barcode scanner, and a back-end linked to the ACH process. From a technology standpoint, many digital wallet options are tailored to specific hardware, effectively segmenting user base by major smartphone players (e.g., Apple, Google, Samsung) followed by a combination of back-end network infrastructure and POS merchant equipment. To facilitate adoption, we believe two implementation paths exist for the digital wallet market. These two routes include 1) “device led adoption” or 2) “infrastructure led adoption.” See Exhibit 2. The U.S. landscape is currently pursuing a “device led adoption” scenario, led by device manufacturers (e.g., Apple, Google, Samsung) striving for consumer penetration by leveraging large installed bases. In conjunction with consumer penetration via smartphone and other devices, major players seek to establish partnerships with financial institutions and merchants in order to facilitate overall user accessibility. In observing Apple Pay’s preparation and rollout, one notes the infrastructure development route Apple sought. Apple Pay was formally announced in conjunction with the iPhone 6 series in September 2014, with the knowledge that Apple’s smartphone penetration and consumer purchase trends were predictable enough to support favorable expectation of digital wallet penetration (as verified by iPhone 6S sales setting new records for Apple due to simultaneous product release in China). Moreover, as early as 2013, Apple had pursued an aggressive partnership strategy, already inking agreement with American Express, MasterCard, and Visa, in addition to major financial institutions, to prepare for immediate rollout following formal product announcement. While Apple’s “device led strategy” was a robust attempt at scaling digital wallet penetration consumer adoption has been slower, as mentioned, than expected due to the unique dynamics of the payments ecosystem driven by infrastructure, fragmentation, and merchants. The second scenario, “infrastructure led adoption,” is illustrated through Sony’s strategy in Japan and future product expansion efforts throughout Southeast Asia. The company’s initial partnership with NTT DoCoMo established mobile device capabilities – since then, the partnership has expanded to agreements with public transit players like East Japan Railway to establish regular, practical applications for the digital wallet. As Kazuyuki Sakamoto, Sony’s senior general manager, stated, “Our approach is different from Apple’s. Without real-life situations where the payments can be used, it doesn’t matter how many handsets you have out there.” Sony leverages the ubiquitous and necessary presence of public transit as the base infrastructure for encouraging not only consumer but merchant adoption as well, essentially pioneering a “soft standard” of payment method. 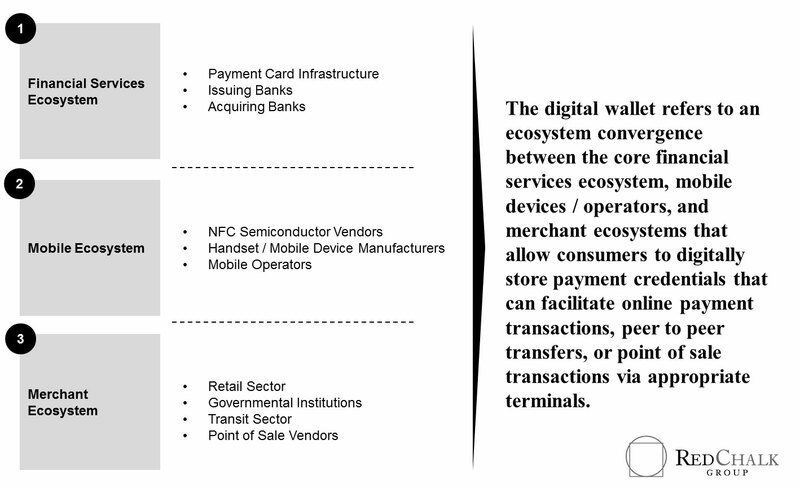 The convergence of ecosystems has created a broader mobile ecosystem supportive of the digital wallet (See Exhibit 3): this includes foundational elements including 1) POS terminal vendors and chipsets (collectively infrastructure), 2) mobile devices, wallet platforms, mobile network operators, and trusted service managers (collectively devices and services), card issuer and payments networks and depository institutions (collectively financial services), and finally 4) retail merchants and public transit players (collectively end-point partnerships). However, rollout differentiation relies on the partnerships (excluding those with financial entities) and determines how digital wallet players will facilitate consumer usage and adoption. Strategically, while the other segments are certainly necessary for product development, partnerships determine the core of how digital wallet players will persuade consumers and drive adoption. As noted previously, the U.S. is currently seeking a retail focused route, attempting to use quantity and accessibility across a large number of participants while regions like Japan, through Sony, is pursuing a targeted method of targeting established applications and services that are incorporated into daily consumers’ usage to drive consumer comfort and a soft standard. Going forward, the digital wallet is expected to continue its evolutionary path in the U.S. driven by a function that incorporates economic incentives for merchants and consumers alike in the form of liability/cost reduction, targeted incentives, and accessibility. While the U.S. market will likely continue to experience fragmentation, market share gains will be driven by a mix of business model innovation (i.e., sharing economics), rich partnership strategies between hardware-centric and service-centric players, and consumer comfort through clear security controls. What business models will succeed in the digital / mobile wallet ecosystem? How will partnership strategies evolve across the ecosystem to incent cooperation? 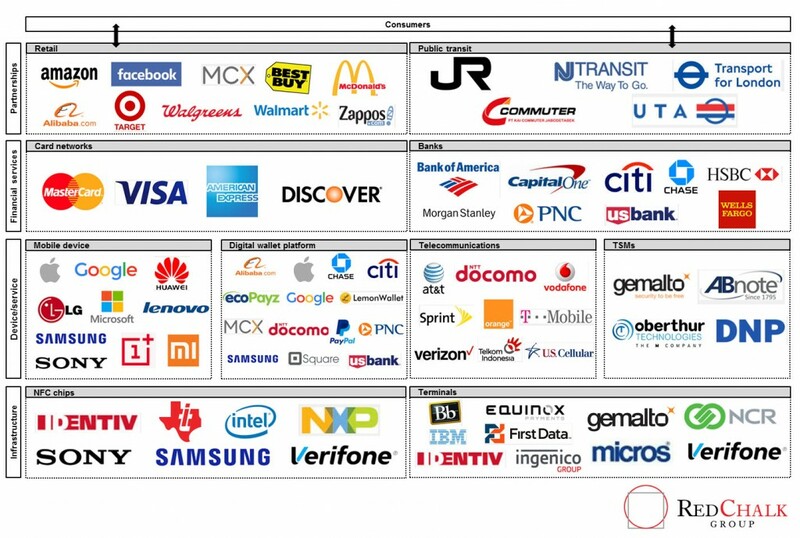 What other strategies may be pursued by smartphone OEMs and FinTech service providers? Will technology disruptors (e.g., Google, Facebook) be successful based on unique advantages? How should incumbent players in the ecosystem react to the disruption posed by new entrants? Where are major investments expected in terms of sub-sectors, technologies, or capabilities?